We’d love your help. Let us know what’s wrong with this preview of Where the Bodies Lie Buried by R.J. Minnick. 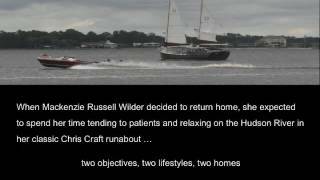 When Mackenzie Russell Wilder returns home to take over Dr. Kesselman’s practice , she expects to spend her time taking care of patients and relaxing on the Hudson River in her classic Chris Craft runabout. But skeletons uncovered on the old family farm seem to dictate otherwise. Residents of Kings Hill and New York State Troopers think her father had something to do with t When Mackenzie Russell Wilder returns home to take over Dr. Kesselman’s practice , she expects to spend her time taking care of patients and relaxing on the Hudson River in her classic Chris Craft runabout. But skeletons uncovered on the old family farm seem to dictate otherwise. Residents of Kings Hill and New York State Troopers think her father had something to do with those skeletons. As bad as her renegade father was, Mackenzie never thought he’d kill anyone. With suspicions about her father poisoning her return and tangible resistance to her medical practice , maybe Kings Hill isn’t the best place for her after all. Mackenzie is determined not to be run off, especially with the way her easy friendship with Lt. Bryan Jamison is ramping up. She wants to stay, but who’s trying to drive her out of town? And why? To ask other readers questions about Where the Bodies Lie Buried, please sign up. I enjoyed this book. Mackenzie Wilder is a medical doctor who began her career after becoming a young widow. She moves back to her hometown to "set things right." She buys back her childhood home--which she loves--and tries to establish a positive identity for herself rather than always living in the shadow of her father, who had a bad reputation because he dealt pot and liquor around town. As soon as Mackenzie arrives in town, she learns that two bodies (skeletons, really) were found buried on I enjoyed this book. Mackenzie Wilder is a medical doctor who began her career after becoming a young widow. She moves back to her hometown to "set things right." She buys back her childhood home--which she loves--and tries to establish a positive identity for herself rather than always living in the shadow of her father, who had a bad reputation because he dealt pot and liquor around town. As soon as Mackenzie arrives in town, she learns that two bodies (skeletons, really) were found buried on her childhood property, and everyone believes her father was the murderer. To me, there are two main story lines in this book: First, we have Mackenzie's adjustment to returning "home" and her desire to establish her identity and to repair relationships with the people she knew as a child. Second, there is the mystery of the bodies: Who are they, and who killed them? I've only read a few mystery novels (mostly Agatha Christie), and in my opinion this book was more about the development of Mackenzie as a character (and her experience returning to her hometown) than the "whoddunit," and I really liked that. I found Mackenzie interesting--she doesn't fit into any stereotypical character boxes--and that part of the story was very satisfying to me. The closure of the mystery didn't involve a major plot twist, and I think that makes this the first mystery novel I've read where the murderer's identity is not revealed as a shock or twist. But that was fine with me; I didn't need that to enjoy the story, and I appreciated not being led down the garden path (I became frustrated with Agatha Christie's novels for this reason; I got tired of being intentionally misled). The pace of the book and the sequence of events were good for me, although I could see them being too slow for some people. There is dramatic action at the end of the book--and I definitely felt the tension while reading it--but I know some readers who would want action and tension throughout. I am not one of those readers (I actually find constant action tedious; I'll take character development over action any day), so that worked really well for me. The only thing I wanted from this book that I didn't get was more information about Mackenzie's life with her deceased husband, Brian. However, because this book is the first in a series, I expect we'll learn more about Mackenzie and Brian's history as we go. To conclude, a simple way for me to judge the quality of a book is whether I'm interested in reading the sequel. In this case, I'm definitely interested in continuing the series. I read this book in the evenings during a long vacation, and I was eager to get back to the book each night. Fans of JoAnna Carl’s Chocoholic Mysteries, Joanne Fluke’s Hannah Swensen Mysteries with Recipes, Kasey Michaels’ Sunshine Girls Capers and Dr. Quinn, Medicine Woman will enjoy Where the Bodies Lie Buried by R.J. Minnick as much as I do. Where the Bodies Lie Buried is the first book in the MacKenzie Wilder Classic Boat Mysteries. Mackenzie, Mackie to her truest friends, is easy to identify with. She was the smart girl with the frizzy hair with a broken home and no boyfriends back in school. Now, Fans of JoAnna Carl’s Chocoholic Mysteries, Joanne Fluke’s Hannah Swensen Mysteries with Recipes, Kasey Michaels’ Sunshine Girls Capers and Dr. Quinn, Medicine Woman will enjoy Where the Bodies Lie Buried by R.J. Minnick as much as I do. 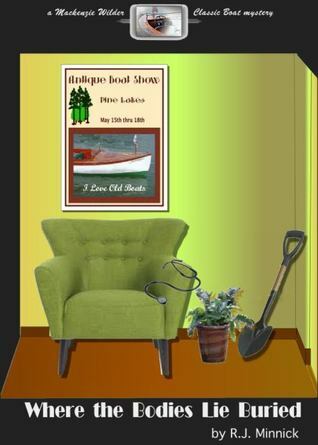 Where the Bodies Lie Buried is the first book in the MacKenzie Wilder Classic Boat Mysteries. Mackenzie, Mackie to her truest friends, is easy to identify with. She was the smart girl with the frizzy hair with a broken home and no boyfriends back in school. Now, she’s a middle-aged childless widow who just wants to go home to rural New York State and restore her parents’ farm, along with some classic wooden boats, while being a damn good country doctor. Unfortunately, it’s rather hard to restore a farm once it’s been designated a crime scene, with no resolution in sight. Skeletons, whether tucked away in a closet, a trunk, the medical examiner’s office, around the farm or all-too-human memories, have a way of complicating things. Particularly if your character of a dad, who’s presumed guilty of the 20yo crime, is no longer alive to defend himself. Add a divorced cop (in which role I cast Matthew McConaughey) and a brilliant, wealthy and fun-loving outsider competing for your attentions, as well as a baseball mom and her cousin who are like a dog on a bone, blaming you for yet another party’s ancient crimes, and you’ve got Mackie’s welcome home. She could take the easy way out and just leave, but would you? At first, I found the end of every fifth chapter to be a natural pause. However, from the end of Chapter 16 to the finish, it’s an edge-of-your-seat thriller. There are a handful of punctuation and other minor typos that Word would have caught, and one repeated error it would have missed (planning versus planing, regarding wood), but they don’t interfere with the quality of the story. I only noticed them as an English major does. I particularly appreciated R.J. Minnick's depth of understanding of substance abuse. It shines through in her handling of key moments. Character development, setting and plot are as flawless as the shine on Mackie’s prized wooden boats. I’m looking forward to diving into the next book in the series, Sweet Corn, Fields, Forever. Where the Bodies Lie is more than a mystery of finding who killed the people buried on Mackenzie Wilder’s family farm. It’s also a story about family and discovery. In a way, the title has a double meaning, for we all have skeletons in the closet. RJ has an interesting and different way of writing a mystery. I found the characters to be far more rounded and three-dimensional than your average detective or PI novel. And did I mention the old boats. As an owner of at least a dozen boats during my Where the Bodies Lie is more than a mystery of finding who killed the people buried on Mackenzie Wilder’s family farm. It’s also a story about family and discovery. In a way, the title has a double meaning, for we all have skeletons in the closet. RJ has an interesting and different way of writing a mystery. I found the characters to be far more rounded and three-dimensional than your average detective or PI novel. And did I mention the old boats. As an owner of at least a dozen boats during my time, I love what RJ added to the story with her classic Chris Craft. I highly recommend this book to readers of Cozy Mysteries and those who like a well plotted and written story. I can’t wait to read what else RJ has written.